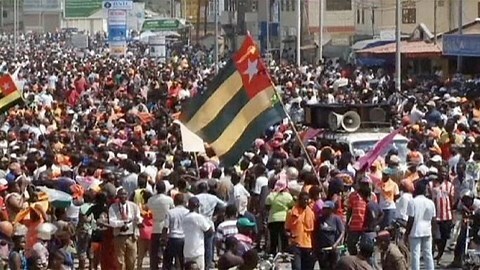 Protesters lined up in the streets of Lome, the capital of Togo yesterday calling for the exit of President Faure Gnassingbe who has been in power for 15years after taking the presidential position from his father, Gnassingbe Eyadema who ruled Togo for 38years. The president of Togo, Gnassingbe Faure had promised earlier to hold a conversation meeting with the opposition party since November but, nothing has been done to validate his promise to this moment. The president of Ghana, Nana Akufo-Addo and Alpha Conde of Guinea who were the mediators have also being working things out in order to have open negotiations between both groups. For now the Guinean and Ghanaian presidents are trying to have ‘appeasement measures’ taken so that the talks can start. The protests are going to continue until our demands our met.